Whether you’re a seasoned outdoors enthusiast with all the right gear for hiking, bike riding, and backpacking or someone who wouldn’t know a seatpost from a trekking pole, the Panhandle Plains region of Texas has a trail for you. Here, we explored some of the best in the state while viewing unique wildlife and spectacular scenery. 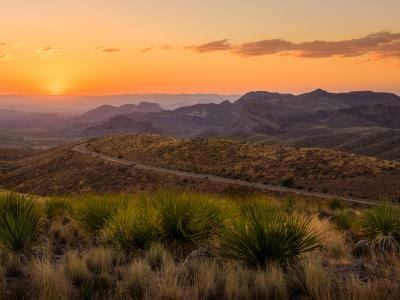 Great exercise, first-rate family time, and some of the most spectacular scenery in the country are only a few of the benefits of hiking, biking, and backpacking in the Panhandle Plains region of Texas. Choice destinations range from rugged terrain and rolling grasslands to manicured trails that are home to a rich variety of wildlife. Since the area is a favorite of mine, I’ve taken friends there on different trips over the last few years. Whether I’m bringing a couple with kids or more experienced “outdoorsy” types, every trip reveals familiar thrills as well as new discoveries. 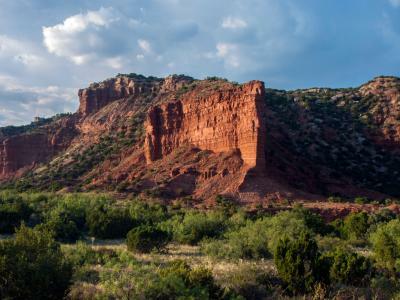 Some of the best hike-and-bike trails in the area’s state parks can be described as “rocks and rolls.” Copper Breaks, Caprock Canyons, and Palo Duro Canyon offer routes that go up on cliffs, down into valleys, and everywhere in between. While active tweens and teens wouldn’t have issues with most of the trails in these parks, I kept this trip to adult friends who were definitely up to the challenges. Copper Breaks State Park is small in size but big on attractions. The trails are well marked, and we hiked a total of 15 miles over two days—with a few stops to fish and swim in the lake. We saw some of the official longhorn cattle that call the park home, and because Copper Breaks is an International Dark Sky Park, nightfall brought a spectacular star show. We had no bikers in our group, but the trailhead for the 9.5-mile Big Loop Trail was near our campsite, and we saw several intrepid riders heading out. Caprock Canyons State Park and Trailway is so named for the many red rock overhangs, or “caps,” that surround the valley. They make for dramatic scenery, especially at sunset. The Caprock Canyons Trailway runs along what used to be railroad tracks. There were several backpackers out to do the whole 64.2-mile trail, but we went only as far as the Clarity Tunnel, 10.5 miles from the Quitaque East trailhead near the park. The Clarity was one of the last railroad tunnels in use in the state and is now home to thousands of Mexican free-tailed bats. We camped nearby so we could watch them swarm out of the tunnel for their nightly feast (of insects, not us). Just north of Caprock Canyons is Palo Duro Canyon State Park, the second-largest canyon formation in the country. We didn’t have time to include it on that trip, and time is what you need to enjoy the unique experience this place offers. It’s a 120-mile-long, 800-foot-deep stunner, with a wide range of hike-and-bike trails and some of the best backpacking in the state. The Gene Howe Wildlife Management Area is a 576-acre refuge northeast of Amarillo. Part of the Black Kettle National Grassland, it features cleared pathways for hiking and biking, as well as a 63-acre lake. When I’d been there on a previous trip, we would hang out near the lake’s marshlands in the evenings to see quail, turkeys, and deer and listen to the coyotes howl. On this most recent trip, however, my husband and I took his son, along with another family, to Possum Kingdom Lake (or “PK,” as the locals say). Located northeast of Abilene in the Plains region, Possum Kingdom is often called the most beautiful lake in the state because of its clear blue water. Surrounded by mesquite-covered hills, it has 300 miles of shoreline, varying from sandy beaches to 200-foot limestone cliffs. There are two excellent trails here, and we started with the easier PK Hike & Bike Trail, which goes up Redbird Hill. It was about five miles long, and the kids actually spotted a possum before it lumbered into the brush. All along the trail are views of the lake, and we glimpsed several boats hauling water-skiers. The Johnson Peak Trail totals 12 miles and was very well marked. Several bikers passed us as we hiked up the steep terrain, urging us along until we finally reached the overlook. On this rise, 350 feet above the lake, the magnificent view was a great reward for the hefty climb. Would you like to hike, bike, and backpack in Texas State Parks and save money in the process? A Parks Pass is only $70, and it’s good for one year of unlimited free entry to more than 90 parks across the state. That means free for you and your carload, whether family or friends, so pile in and come on out! 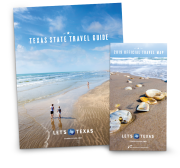 The pass is available at any state park or online at http://tpwd.texas.gov/state-parks/park-information/passes/sppass-faq.